In Myrmes, players each control their own ant colony, and, over the 3 years of the game, they try to have the most dominant ant colony (evidenced by having the most victory points). 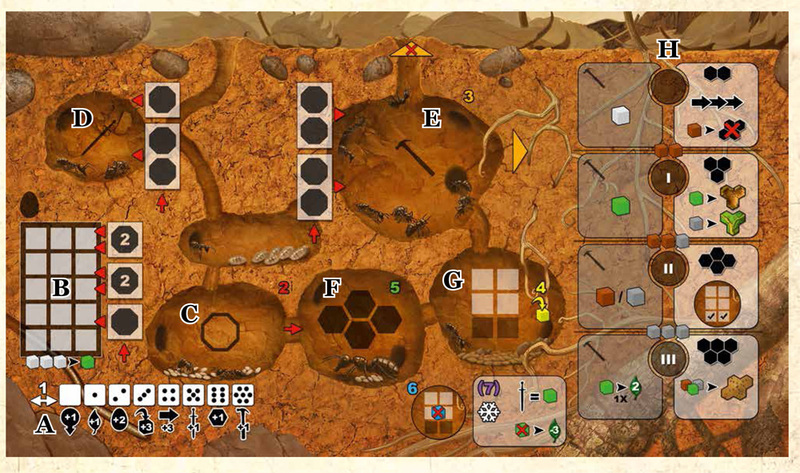 The gameplay is split amongst two different areas – an individual player board where the player can work on developing his own colony and the main board which represents the outside world – here the ants interact with each other and hunt prey. On your individual board, you have different rooms where you make/keep different sorts of ants: larvae, nurses, soldiers, workers. There is also a space ants to work and space to keep the resources that your ants make. Finally, there is track which shows the complexity of your ant colony – the further along you are on the track, the more resources your ants will be able to make and the more choices they will have when they venture outside your colony. 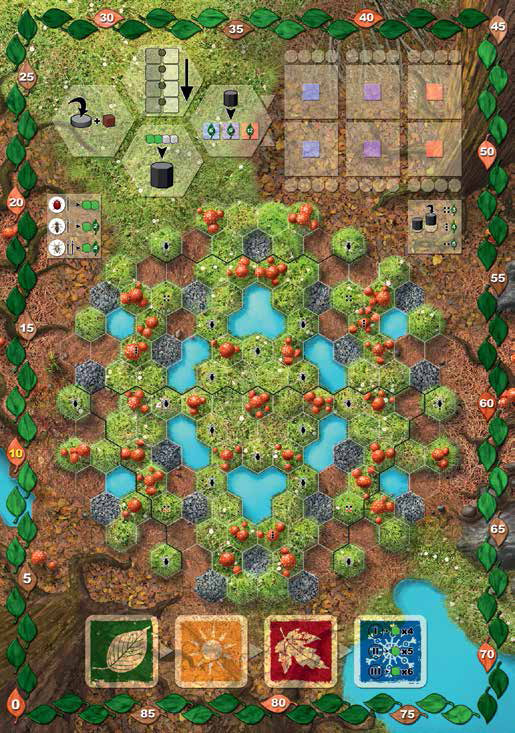 The main board has a land area, split apart by a hex grid. There are a couple of different terrain types on the map. Additionally, there are some spaces where prey tiles will be located – these can be hunted down by your ants for victory points. Ants will be able to place pheromone tiles down on this hex map as well for VPs. On this board, there are also spaces for objective tiles – tiles which can be completed for victory points. In setup, each player gets their personal colony board, 3 nurses, 2 workers and 1 larvae. The season dice are rolled, and players can see the numbers. The number on the die corresponds to an event – which can be seen in the lower left of your personal board. On the main board, the initial tunnel openings are placed on the map as well as the starting prey tokens. 1) Event – In this phase, each player can choose to modify the event – you can discard one of your larvae to move the event marker one space to the left or right. You can do this as many times as you want until you get to the desired event for your ant colony that season. There are 8 different events – they will allow you to give birth to extra ants of a certain type, have better movement ability on the main map, score more victory points, increase the complexity of their colony, etc. Whichever event you choose will be in effect for the rest of this season. This is your personal ant colony board. The events are seen in the bottom left corner here. 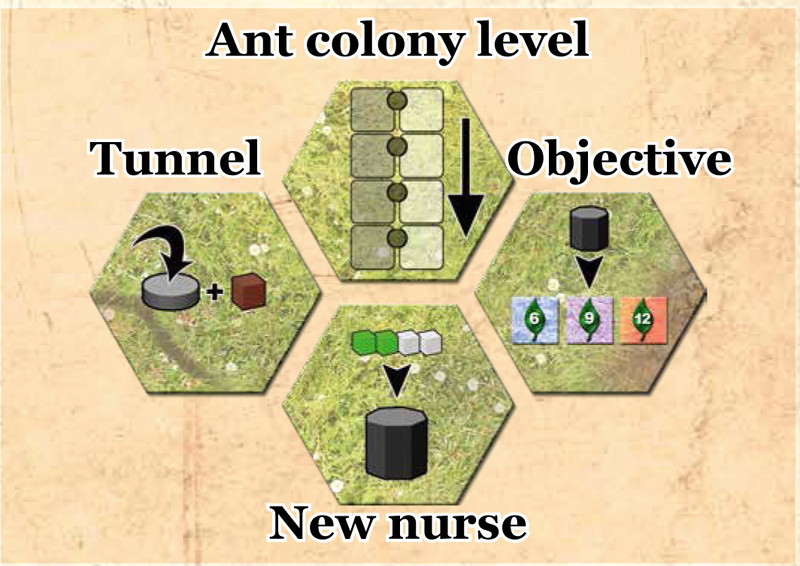 2) Births – Now, you take the nurses in your colony and move them into different rooms in your colony. If placed in the larvae, soldier or worker rooms, they will become that type of ant. If they are placed in the Atelier room, they will be able to take a special action in Phase 5. This is done simultaneously. 3) Workers – going in clockwise order from the start player, each player takes turns to make one of his workers do something. The worker can stay within the ant colony and do something. The chart at the right of the personal board (see above) shows the possible actions – at each level of complexity, one ant may work each season. The ant is placed on the box on the left side and the corresponding cube(s) is made.At the most complex level, the worker ant feeds the Queen and is rewarded with 2 Victory points. The worker can also go outside and do something: hunt prey, place a pheromone tile, place a special tile or clean up an exhausted pheromone tile. Regardless of what this worker ant does, it is discarded afterwards – this ant will never return to the colony (sniff, sniff)… The ant emerges from any of the anthills of its color and then has 3 movement points to explore the area. If it encounters its own color pheromone tile, it can cross the whole thing for 1 movement point. 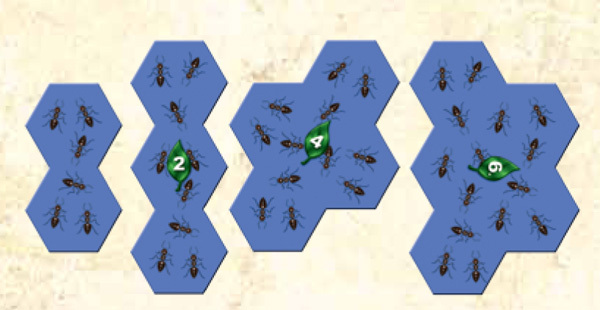 It can cross opposing pheromone tiles, but only if the player sacrifices a soldier ant from his individual board. If the worker ant comes across a prey tile, it can notify its soldier brethren to come take care of it, and then depending on the prey type, different things happen including getting resource cubes and/or scoring victory points. The worker could choose to place a pheromone tile – the size of which is dependent on the complexity of the ant colony. It cannot overlap another pheromone tile nor can it cover water. When it is placed, cubes are placed on top of it corresponding to the hexes that were covered. Victory points are scored for placing larger pheromone tiles (0, 2, 4 or 6 VPs for level 1,2,3 or 4). The worker ant could also clear a pheromone tile. As I mentioned earlier, when you place a pheromone tile, you place cubes on top of it. If that tile has been emptied of the cubes, that empty pheromone tile can be discarded. If there were any VPs on this tile, they would be scored by the player who cleared it off the board. After the tile is removed, the ant can resume its movement and still take one of the other actions. The worker could also place a special tile. Different resource cubes are needed to place the different types of special tiles. They give their rewards in the Harvest phase. 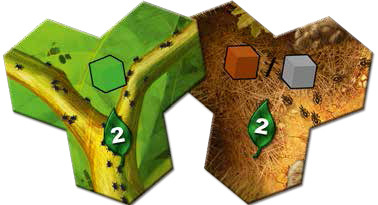 4) Harvest – In this phase, each player must pick up one cube from each of their pheromone tiles. Additionally, each special tile provides something to the player as well. 5) Atelier – Any nurses that were placed in the Atelier room in the colony are now moved to the main board. There are four possible different actions in this phase, and each player can place one ant in each area. You could increase the complexity of your ant colony. You could add a new anthill tunnel entrance somewhere on the main board map. You could score one of the objective tiles on the board. Finally, you can make a new nurse tile – which will be usable from the start of the next season and will thus give you one extra worker/atelier every turn thereafter. Scoring objective tiles appears to be the way to score the most VPs in the game. There are 3 levels of objectives, with 2 options at each level. You must first score a level 1 objective before you score a level 2 objective, etc. Generally, to score an objective, you need to discard the things pictured on the tile. You score 6 VPs for each level 1 objective, 9 VPs for level 2, and 12 VPs for level 3. In addition, there is a bonus for completing them early – anytime someone scored an objective that you’ve already finished, you get a 3VP bonus. 6) Clean-up – At the end of the season, you keep your limit of cubes (4 or 6 depending on colony complexity). All of the workers and nurses within the colony are recovered. The first player marker moves one position to the left. Finally, you look at the event die for the upcoming season and move your event marker on your personal board to the corresponding spot. Unless it’s the end of Fall, because there is no die for Winter. 6b) Winter – If it’s Winter-time, you move into a special upkeep season. In year 1, you must discard 4 food cubes. In year 2, discard 5 food cubes, and in year 3, get rid of 6 food cubes. If you have soldiers in your colony though, each soldier present reduces your cube requirement by one. For each cube you are short, you lose 3 VPs. After the food has been discarded, re-roll the season dice to get ready for the next year. Scoring – After the end of the third year, the game ends. The player who has the most victory points at that time wins the game. There are no end-game bonuses for victory points. To recap, you score VPs during the course of play by 1) placing pheromone tiles (0-6 VPs), 2) hunting prey (0-4 VP), 3) feeding the Queen (2 VP), and 4) finishing Objective tiles (6,9 or 12 VP + 3VP bonuses). This was one of the most anticipated Essen releases for me – as the complexity and planning of the game looked to be right up my alley. I’m glad to say that the game has pretty much met my expectations. The thing that I love most about the game – and the part of the game that I think will polarize opinions of the game – is that this is the sort of game where you have to plan your entire turn in the first phase. As I mentioned in my first impressions of the game, the planning aspect reminds me of Age of Steam, a game which remains in my all-time top 5. The other game that this reminds me of is Princes of Florence – because they both give the player a limited and known number of actions in the game. Yes, I know that plenty of games only have a limited number of actions, but PoF was the first one that I ran across way back when, and I’ve always associated that trait with PoF! What do I mean by planning? You almost have to work backwards to the end of the turn to make your plans. The biggest part of the turn is figuring out what your ants are going to do on the outside board. Do you plan to attack prey? maybe clear some pheromone tiles? Do you need to go out to collect certain colors of cubes in order to make a new nurse or achieve a special goal? Once you make those plans, then you have to make sure that you have enough nurses placed to generate the right number of worker ants, soldier ants, or atelier ants. And, moving backwards even one more step, then you might want to manipulate the special event for the round to best help you achieve your goals for the turn. I love that sort of planning, and you still have to be flexible enough in your plans (like Age of Steam) in case your plans are thwarted by the actions of another player. At least turn order is stable – simple clockwise order – in Myrmes, and the start player simply rotates one position clockwise each turn. That stability makes it a lot easier to plan ahead and feel like you have a bit more control over the action. Planning is important because a lot of the game happens on the outside map. While you do have your own little sandbox of your anthill to do some planning, the bulk of the resources are gained from the outside map, and competition can get fierce as the map gets progressively crowded through the course of the game. In my limited experience of the game – only 4 plays so far – I have found a fair amount of success in making sure that I have enough larvae in the final turns to move the event die to wherever I need it most. Of course, this amount of planning could cause the game to slow down a bit because a fair amount of thought is needed for the planning – but in my group, this has not turned out to be an issue. Our four player games still usually come in around 75-90 minutes, which is a nice length for a game of this meatiness. The artwork is appealing to my eye, and the components are standard Ystari quality. They do include little plastic ants to stand in for the worker ants and soldier ants, which my kids really like. As I am not a gaming parakeet, they neither add nor subtract to the game for me. It should be noted that the bonus pheromone tiles have a misprint – though it is not a functional issue. The rules are correct, and it is simple to explain the misprint on the tiles. The good news is that the Ystari/Asmodee are already working on a fix, and that the game is fully playable even without any fixing. Overall, I find this to be a tight design with plenty of interaction between the players. It is certainly too complex for a casual gamer to pick up and play, but for those looking for a deeper game, I think there is a lot to think about here in a 90-minute playtime. Lorna: Played twice. I thought this was an ok game of maximizing moves. Nothing felt really fresh or new to me except maybe the pheromone portion of the game. Compared to some of the other games that were released around Essen, this would be a second tier game for me. Happy to play it but it missing that little something that puts it over the top. Mark Jackson: Only one play (online at yucata.de)… while I see why others might enjoy it, I found the things that Dale liked about it (the intense level of need for look-ahead & planning) to be less appealing. Ben McJunkin: I played it twice at BGG.Con, though the sessions were somewhat marred by minor rule confusions, so take my perspective with an appropriately-sized grain of salt. Although I understand Dale’s comparison to Age of Steam and Princes of Florence, Myrmes borrows most heavily from Antiquity — enough so that I found myself wishing that I were playing Antiquity instead. Most of the game’s challenge came in phases 1 and 2, which are performed simultaneously by all players, lending the game a rather solitary feel; I would have preferred to see the spatial aspects of the communal board play a larger role. I also would have liked to see more dynamism in the the winter food requirements and the Atelier scoring opportunities (presently, they feel a bit uninspired). I think Myrmes possesses a very solid Eurogame core, combining known elements in a challenging way, and exhibits enough potential that I am interested in playing it further. However, I am yet to be wowed by the game, and I have been much more impressed by other, comparable games released this year. Jonathan Franklin: I played it once after Essen. I like the programmed actions part of the process and the constant desire to do more than can with what is available. It has a bit too much interaction for me without enough payoff for that interaction. I have no need to battle over pheromones and was annoyed when my whole setup for the turn crashed because I could not get to a spot I had planned on being able to get it. It is not nasty interaction, just inadvertent thwarting of someone else’s plans. Given how few turns there are, I’d generally rather play something else, but would be fine playing Myrmes if people want to and everyone moves quickly. Jennifer Geske: I played it twice so far and it’s still on my top-5 list of the Essen releases. I am not sure if it should get the ‘love it’ rating yet as I have some concern about replayability. I am partial to worker placement games, and this one has the right balance between engine building (improving colony, getting more nurses, etc.) and tactical maneuver (both in terms of network building and claiming bonus tiles) to keep me engaged even while AP-prone players are taking their turns. I also like the strategic planning aspect of figuring out what could happen a few turns in the future. I see how it’s possible for other players to take over your territory and ruin your plan as described by Jonathan, but I think it’s something you can somewhat mitigate with careful planning. Tom Rosen: I have played twice and subsequently ordered a copy. I’m on the fence between like and love it below, but since I currently rate it an 8, I decided to join Dale in the “love it” camp (which is a rating I get to use so rarely these days it seems). 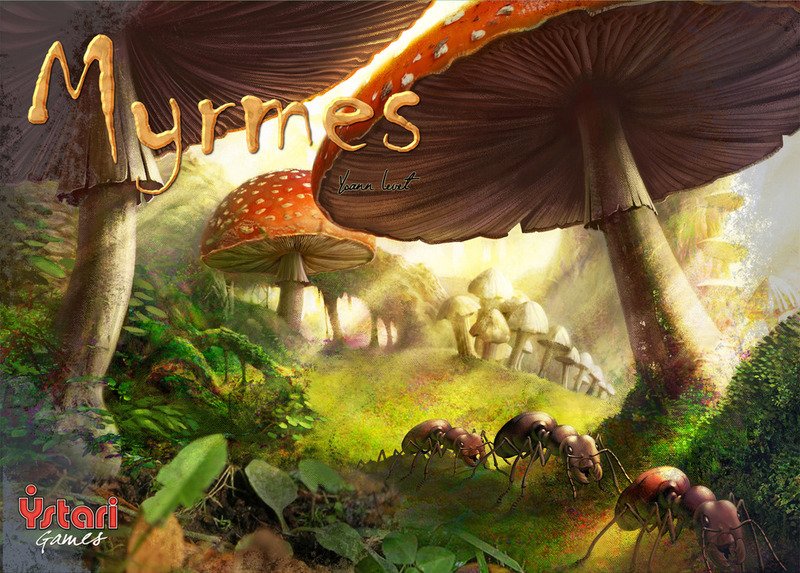 I am certainly looking forward to my copy arriving and getting the chance to play Myrmes again. I wasn’t entirely sold after my first play at BGG.CON, but gave it another shot the next day and enjoyed the second play a good deal more. I’m hopeful that this upward trend continues in my eventual third play. As others have said, there is a lot going on in this game and even more importantly, a number of different ways to score points. In one game I ended one or two points apart from someone and we’d each gotten the vast majority of our points from two completely separate facets of the game. Ben and I discussed the surprising similarities to Antiquity after playing the game, so I agree with him about the interesting similarities, but disagree that I’d rather just be playing Antiquity (even though Antiquity is a top 10 game of all-time for me). The two reasons for that are that: (a) exploring new game systems is fun for me even if they are ultimately not quite as good or don’t have as much staying power as old favorites (your mileage may obviously vary in this regard); and (b) I don’t always have the time or energy for a game of Antiquity, plus with over 30 games of Antiquity under my belt, it can sometimes be a bit lop-sided, whereas the similarities with Myrmes don’t really give me a leg up in this new game. All that being said, the similarities are probably being exaggerated by all this talk, it’s just that the board play and resource harvesting were reminiscent of the Splotter classic, and that’s a good thing. If you’re looking for a new heavy German-style game among the latest Essen releases then I think Myrmes may be your best bet (because while Keyflower and Ginkgopolis are also very good, and maybe better, they’re not quite so heavy and complex as Myrmes). Luke Hedgren: A lot of ground covered above, and I will say that I totally agree with enjoying the tense-ness of the full turn look ahead. Initially I would have been a Love It with Tom and Dale, but I think the one thing that knocked this down for me was the lack of variability in the games I’ve played. Even with the event die roll and the differing goals, the games still played out similarly. Maybe it’s just my newb-ness. I do look forward to more plays, and if I see the error of my similar playing ways, Myrmes could bump back up to Love. Mark Jackson played on Yucata? I don’t see it in the list of games, was this some sort of pre-release development version? I thought it was yet another snowball engine game. Boring. The player interaction seemed forced and didn’t come until late in the game.